opens a water control valve. This allows water to flow through the piping system to all sprinklers. allows water to flow into the piping system. Subsequent water discharge occurs from individual sprinklers as they respond to the heat of the fire. 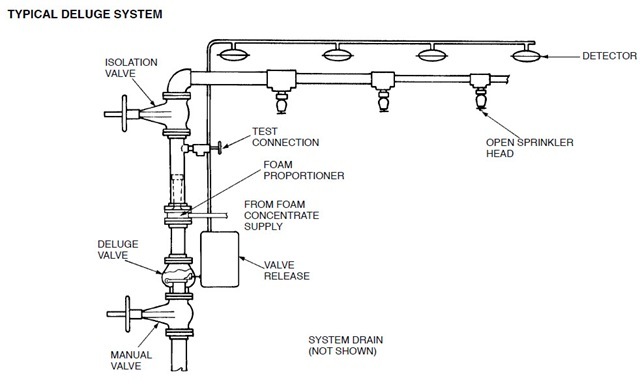 The system shown below uses HAD’s (Heat Actuated Detectors) and a dropweight release to open the preaction valve. Alternate detection systems can also be used. 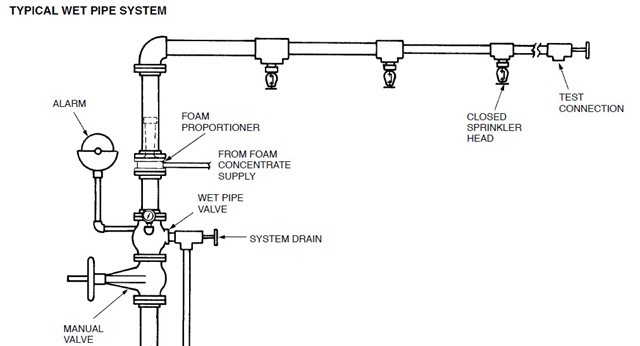 Pre-priming foam solution is not needed as foam will be proportioned into the piping during operation. 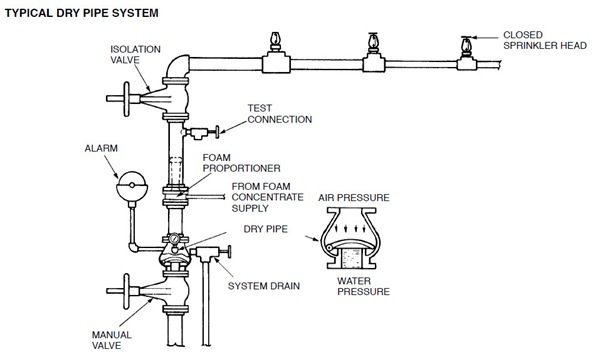 Dry pipe systems use automatic sprinklers that are attached to a piping system containing air under pressure. When the air is released from the opening of the sprinklers, the water pressure overcomes the lessened air pressure and opens the dry pipe valve. The dry pipe valve is designed so that a moderate air pressure prevents a higher water pressure from opening the valve. Once the valve is opened, the water flows into the piping system and out the opened sprinklers. This system provides protection in areas subject to below freezing temperatures. Piping must be drained of water or foam solution following operation to prevent freezing. Typically, upright sprinklers are used to allow drainage. Otherwise, approved dry pendent sprinklers must be used to prevent freezing. Dry pipe systems are inherently slower in operating and should be considered less desirable for applications using AFFF. This system uses automatic closed-head sprinklers that are attached to a piping system containing water. Water discharges immediately from those sprinklers opened by a fire. A flow of water through the valve sounds an alarm. An automatic sprinkler system is designed to distribute water or foam solution to a specific hazard area. The application rate, commonly referred to as ‘‘ density,’’ is frequently expressed in units of gallons per minute per square foot ( gpm/ ft2) or liters per minute per square meter (Lpm/m2) of area. heads that may operate in a particular fire situation and governs the maximum spacing allowed between sprinkler heads. The sprinkler head provides for a nearly uniform distribution of water or expanded foam over a given area. The solution strikes a deflector and is broken into a circular pattern of distribution. Spacing of sprinkler heads results in overlapping patterns to ensure uniform coverage and effective fire control. Pipe sizing to the sprinkler heads is commonly determined by hydraulic calculations to assure an adequate supply of water and uniform distribution from the sprinkler heads. The standard addressing sprinkler system design is NFPA Standard 13 or BS EN12845. Additional guidance for foam systems design is contained within NFPA Standards 11, 16, and 30. 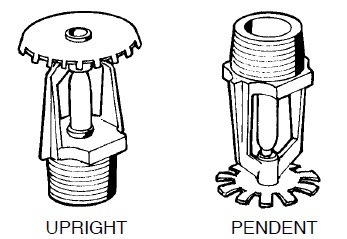 Conventional sprinklers heads are available for either upright or pendent installation. A heat sensitive element, consisting of either a fusible link or frangible glass bulb, is rated for a specific operating temperature. A standard orifice sprinkler is 15mm; however, various small and large orifice sprinklers are available to achieve the desired density with the available water supply pressure. Conventional open sprinkler heads, without the heat-sensitive element, are used for total area flooding “deluge” systems. In applications using AFFF concentrates, the conventional sprinkler is acceptable. The UL listing directory should be consulted to ensure the sprinkler head is listed with the manufacturer’s foam concentrate. 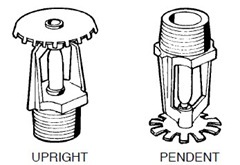 Acceptable foam quality is expected from conventional sprinkler heads of similar design to those listed. These sprinklers cannot be used with protein or fluoroprotein base foam concentrates which require air aspirated discharge devices. available corresponding to a K-Factor of 3.0.
only be open-head systems as these sprinklers are not available with heat-sensitive elements. 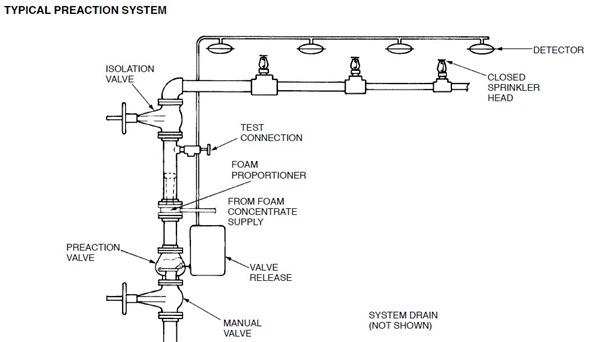 Closed-head sprinkler systems can be of three different types: wet pipe, dry pipe, or preaction. An AFFF foam can be used in any closed-head sprinkler system as covered by NFPA Standard 16 – Foam/ Water Sprinkler Systems.